On Monday, publisher Conde Nast added The New Yorker to its growing list of publications with custom iPad apps for reading magazine issues. Issues on the iPad will contain all the content of the printed magazine, but optimized for reading on the iPad. They will also include bonus material such as audio, video, slideshows, and additional cartoons. The App Store description also lists stories from the archive, resizable type, sharing, and “favoriting” as upcoming features for the app. For the release, The New Yorker created a funny, but not all that informative, introduction video featuring actor Jason Schwartzman. 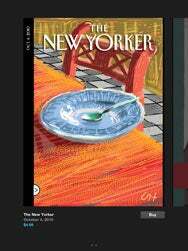 As a longtime subscriber to the The New Yorker in print (who just re-upped for three more years), the lack of reciprocity with my print subscription is disappointing, and I hope Conde Nast and Apple figure out a mutually-beneficial way to offer app-based magazine subscriptions soon. For those print subscribers who want to read on the iPad without spending any additional cash, the magazine recently updated its Digital Edition, which provides Web-based access to current and past issues to magazine subscribers, to work with the iPad’s Safari browser. It’s a nice way to read on the iPad—and several days before I typically receive my issue in the mail—but it’s still somewhat buggy, and only works when you have Internet access. The app is compatible only with an iPad running iOS 3.2 or later. Conde Nast currently has iPad apps for several of its titles, including Wired, Vanity Fair, and GQ.